Sea to Summit Ultra-Sil TarpPoncho. Sea to Summit now makes the all-in-one raincoat/pack cover/groundsheet/tarp with 15D Ultra-Sil®Nano fabric – this saved 3 ounces and 30% of the packed size when compared with its 30D Ultra-Sil ® predecessor. It is ideal for temperate climates or as an emergency shelter. 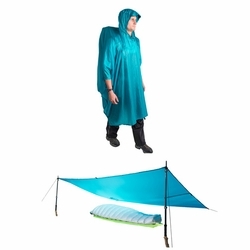 The Sea to Summit Ultra-Sil Tarp Poncho is ideal for use as a rain poncho with an ergonomic 3-panel hood with functional and generous brim. It is now made with Sea to Summit's super lightweight and waterproof Ultra-Sil fabric, so all seams are factory taped. Designed to fully cover you and your pack in a downpour. It’s also ideal for temperate climates when a waterproof jacket would be too sweaty. Makes a great emergency shelter to have along for day trips.